Vaccination is one of the most important public health tools of the 20th century that led to several crucial goals. Indeed, it has led to eradication of small pox, elimination of poliomyelitis from Europe and dramatic decrease of mortality and morbidity of communicable diseases preventable by vaccination. It is estimated that worldwide vaccination prevents 2.7 million cases of measles, 2 million cases of neonatal tetanus, and 1 million cases of pertussis each year. In Europe, seasonal influenza vaccination prevents around 2 million cases each year. However, vaccination programs are facing considerable challenges, such as a decline in vaccination coverage in some countries, the increasing cost of new vaccines and shortages in supply. In addition, misconceptions about vaccination can further shift the public focus from the individual and collective benefits of vaccination to increased distrust and fear of possible side effects. As underlined during the workshop on "Seeking new partnerships for EU action on vaccination", organized in Brussels by the DG SANTE on 31 May 2017, one of the main factors contributing to a critical view to vaccination seems to be its success in reducing the burden of many vaccine preventable diseases in Europe. Indeed, as the incidence of the disease decreases, people's perception of the risk associated with these diseases may also decrease, affecting in turn the perception of the perceived value of vaccines. Furthermore, misconceptions about side effects of vaccines are leading to distrust and fear about their safety. In this challenging and complex environment, there is a clear added value in involving all the stakeholders within the EU and in working with global partners to ensure the sustainability and effectiveness of vaccination programs. In particular, the role and requirements for health care workers to better advocate and promote vaccination and to enhance people ́s trust in vaccines and vaccination programs appears fundamental. This requires education in the area of immunology and vaccinology, and continuous professional training of health care professionals (medical doctors, nurses, pharmacists etc.). Communication skills and training in social science are also important to understand the reality of the patient beyond his medical condition and communicate adequately. Furthermore, school health education programs should address vaccination to enhance sensitization of future generations. Moreover, it is important to improve access to vaccines and the research to evaluate impact and effectiveness of alternative vaccine delivery models, e.g. administration of vaccines in pharmacies or outside settings, as also the added-value of sharing best practice and information to update and learn from each other to better understand and tackle vaccine hesitancy, broaden opportunities of access to vaccines and improve education and training of healthcare professionals. In mid-2018, the European Commission will adopt a proposal for a Council Recommendation on Strengthened Cooperation against Vaccine Preventable Diseases, and it has recently launched a public consultation on possible activities to be included in a proposal for stronger EU cooperation against vaccine preventable diseases, which will be adopted in 2018.
to collect the views and input of citizens, advocacy groups, Institutions and other relevant stakeholder to feed into the process of drafting a proposal for the Council Recommendation. to demonstrate what citizens and advocacy groups, in partnership with stakeholders can offer in terms of raise awareness about the phenomenon, enhance the body of knowledge of positive cases and success, and strengthen commitment to this topic. To promote a first civic assessment on vaccination coverage across Europe, it means an assessment that starts from a citizens and patients perspective. 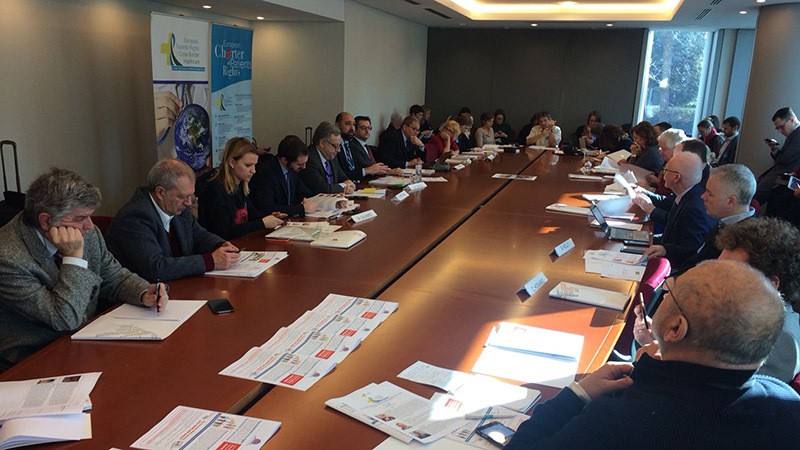 Immediately after the recent announcements on EU action on vaccination by Commissioner Vytenis Andriukaitis, the initiative testifies a concrete example to transfer the recent achievement on the topic from the European to the national level. Cittadinanzattiva and its EU branch Active Citizenship Network strongly believe that vaccination is a right and an extraordinary tool of public health, which must be known, valued, spreaded and used in the interests of individuals and the community. However, it is necessary to work and contribute to a proper vaccine culture. In addition, it is necessary to ensure rigor and transparency, in order to recover confidence in science. It is therefore necessary to eliminate the alibi, to ensure the rigor of the vaccination safety guarantee.